European majors are generally under pressure today. Weak economic data from Eurozone and UK is one of the factors. Stocks are indifferent to the data though, and rise broadly probably on expectation that loose monetary policy will stay longer. Selloff in Swiss Franc is also apparent, in particular with USD/CHF and EUR/CHF taking out near term resistance. On the other hand, Australian Dollar maintains post RBA gains and is trading as the strongest ones for today with New Zealand Dollar. Greenback is also trying to extend recent rebound. Technically, USD/CHF has taken out 0.9994 resistance to resume rise from 0.9716 already. EUR/CHF also broke 1.1429 to resume rise from 1.1181. GBP/USD’s break of 1.3012 minor support is the first sign of bearish reversal on rejection by 1.3174 key resistance. Focus will turn to 1.1407 minor support in EUR/USD to confirm Dollar’s underlying strength. 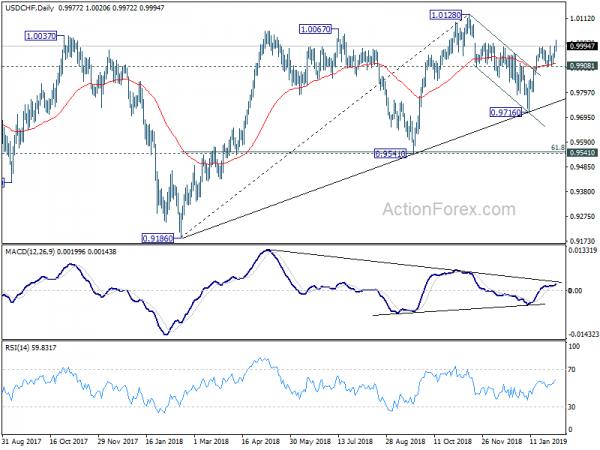 Despite today’s rebound, AUD/USD is help below 0.7295 resistance and EUR/AUD is kept above 1.5721 support. Aussie bulls are not that committed. In other markets, FTSE is currently up 1.23%. DAX is up 1.05%. CAC is up 1.00%. German 10-year yield is up 0.0101 at 0.189, but stays below 0.2 handle. Earlier in Asia, Nikkei closed down -0.19%. Japan 10-year JGB yield rose 0.0036 to -0.008, staying negative. China, Hong Kong and Singapore are on lunar new year holiday. UK Prime Minister Theresa May will travel to Brussels on Thursday to meet European Commission Jean-Claude Juncker. Obviously Brexit withdrawal agreement and Irish backstop will be the purpose. UK PMI Services dropped to 50.1 in January, down from 51.2 and missed expectation of 51.1. That’s the lowest level for two-and-a-half year and the second-weakest since December 2012. Markit also noted that business activity stagnates amid modest drop in new work. Staffing levels decline for the first time since December 2012. And, strong input cost inflation persists at start of 2019. Eurozone PMI Services was finalized at 51.2, revised up from 50.8. That’s unchanged from the 49-month low recorded in December. PMI Composite was finalized at 51.0, lowest in five-and-a-half years. Among the countries, France PMI composite dropped to 48.2, 50-month low. Italy was at 48.8, 52-month low. Germany recovered to 52.1, a 2-month high. But Ireland dropped to 53.3, 67-month low. Chris Williamson, Chief Business Economist at IHS Markit said, “the eurozone has started 2019 on flat note, with growth close to stagnation amid falling demand for goods and services.” And, “GDP is growing at a quarterly rate of just 0.1%, setting the scene for the region’s worst quarter since 2013.” And that would also mean ECB’s projection of 1.5% GDP growth in 2019 is “likely to be revised lower” and “lead to more dovish signals from the ECB”. Also from Eurozone, retail sales dropped -1.6% mom in December, matched expectations. There are some dovish tweaks in the statement, including mentioning of increased risks, downgrade of growth and inflation forecasts. But for now, the statement still suggests the next move is a hike rather than a cut. Just that it may take longer to happen. On inflation, RBA now expects underlying inflation to hit 2% in 2019 and 2.25% in 2020. Headline inflation is also expected to decline in the near term due to petrol prices. That’s also a downgrade as in previously, RBA expected inflation to hit 2.25% in 2019 and a bit higher in 2020. Also from Australia, AiG performance of services dropped sharply from 52.1 to 44.3 in January. Retail sales dropped -0.4% mom in December versus expectation of 0.0%. Trade surplus widened to AUD 3.68B in December versus expectation of AUD 2.25B. Daily Pivots: (S1) 0.9948; (P) 0.9971; (R1) 1.0003; More…. USD/CHF’s rise break of 0.9994 resistance suggests that rise from 0.9716 has resumed. Intraday bias is back on the upside. Outlook is unchanged that corrective decline from 1.0128 should have completed at 0.9716 already, after hitting trend line support. Further rally should now be seen back to retest 1.0128. On the downside, break of 0.9908 is needed to indicate completion of the rebound. Otherwise, outlook will stay cautiously bullish in case of retreat. In the bigger picture, USD/CHF drew strong support from medium term trend line and rebounded. That suggests rise from 0.9186 is still in progress. Further break of 1.0128 will confirm up trend resumption and target 1.0342 key resistance. 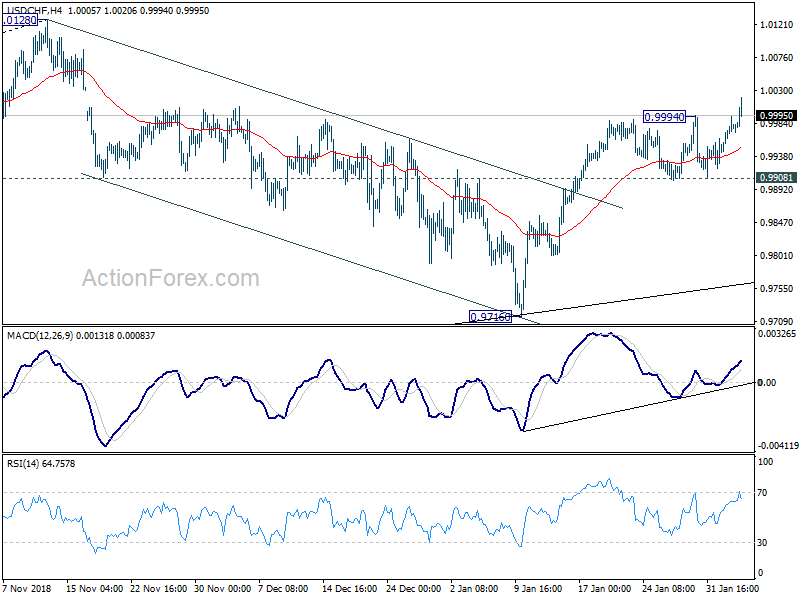 Nevertheless, break of 0.9716 will dampen this bullish view and at least bring deeper fall to 0.9541 key support.